Boone Central and Battle Creek were both guilty of numerous early-season miscues Friday, Sept. 3, but the visiting Braves were able to capitalize on an 83-yard kickoff return and 59-yard touchdown pass in the second half to post a 25-21 victory over the Cards. Boone Central took its first lead of the contest on Zach Wurdeman’s second touchdown pass to Keenan Howell with 1:29 remaining in the third quarter, but moments later Battle Creek delivered a kick to the Cardinals’ gut as Payton Prauner took the ensuing kickoff and raced 83 yards through Card defenders to score. The Braves added two touchdowns in the first half of the final period, then held off a Boone Central rally attempt in the final minutes to escape with the win. “Both teams made a lot of mistakes,” acknowledged Cardinal Coach Arnie Johnson. “I think the fact that Battle Creek was able to make more big plays than we did made the final difference. “As the year goes on, you learn more about the chemistry of your team,” he added. “Right now, I would say we have a team that plays with a lot of heart. Statistically, Friday’s contest was quite even. Battle Creek totaled 320 yards, 138 rushing and 182 through the air, and gained 18 first downs. Boone Central outrushed the visitors (157) and totaled 283 yards with 20 first downs. Battle Creek was penalized 10 times for 83 yards, Boone Central eight for 60. Both teams lost three fumbles, but the Braves held a 3-0 edge in interceptions. 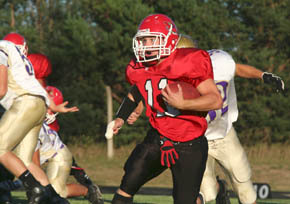 In the end, it was those big plays by Battle Creek and some near misses by the Cardinals.